Dr. Kami Parsa is committed to bringing patients only the most advanced treatments. 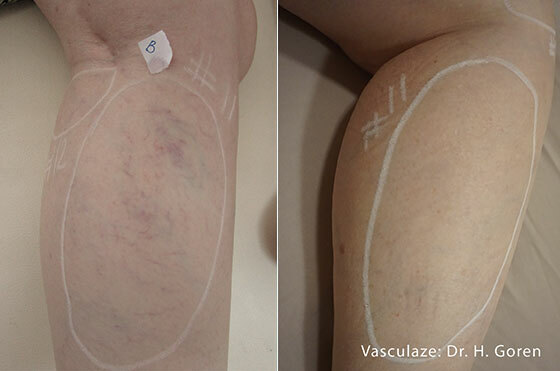 If you suffer from vascular lesions including angiomas, telangiectasias, port-wine stains and leg veins, the InMode Vasculaze is a revolutionary treatment option that may benefit you. We can treat patients right here at our Beverly offices. The InMode Vasculaze uses high peak power that Dr. Parsa employs with precision to treat vascular lesions and leg veins. The treatment involves targeting hemoglobin to provide a fast, effective and safe treatment for patients. If you want relief that is long lasting and carried out under controlled conditions by an experienced oculoplastic and reconstructive surgeon, seek consultation in Beverly Hills with Dr. Kami Parsa. Why Choose Dr. Kami Parsa? When you are searching for a treatment that rejuvenates skin and is effective for vascular lesions and leg veins, choosing a doctor who has specialist skills and training is important. Dr. Kami Parsa is an expert in the fields of oculoplastic and reconstructive surgery. He has extensive experience in treating patients for conditions that affect the aesthetics and function of the skin. Dr. Parsa is a foremost authority in his field and has been involved with clinical and scientific research projects. His dedication to always advancing his knowledge and implementing new procedures for the benefit of patients makes Dr. Parsa a trusted choice when it comes to vascular lesion and leg vein treatments in Beverly Hills. For a one-on-one consultation in comfort with a doctor who understands, you can always rely on the compassion and care of Dr. Kami Parsa. Contact our office today if you have received treatments in the past for vascular lesions or leg veins that were ineffective. We use the latest in technological advances with the InMode Vasculaze to treat our patients in Beverly Hills.